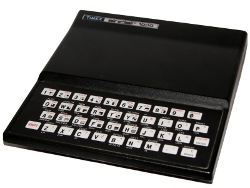 I often search around the web looking to see what kind of ZX81 community still thrives. I truly expected to find a community in decline, but a surprising number of nostalgia sites are still out there. I found some dedicated to hardware, some to emulating, and others to software. Some are reference sites offering up tips and how to do things. Others simply have reviews of software from a different era. All of them interesting in their own way. My favorites are those that give a little background about what they offer. If it is software, they author might offer up some insight into the games making or talk about some of the history about the company that made it. Whether these articles inspire my writing is debatable. I do enjoy an interesting story or alternate view of the mundane. And to that end, I think I�ll start to share some of the sites I run across. One site that caught my eye recently is one from The Monkey�s Brain. There it gives viewers a section on retro gaming. He has a ZX81 section that provides a nice review of some of the great ZX81 games. Sadly, I hadn�t played many of these as most of my ZX81 games, other than my own of course, were from books. Back to the site, you�ll find a nice list of games with short reviews. The are interesting to read and the animated GIFs give you a feel many of the games. The author discusses why you should care about the games, while being honest where the games may suffer. Don�t expect some 3D ultra hi-res spectacular here. These are vintage computing games of pure monochrome goodness. Go enjoy it. Meanwhile, I think I�ll keep on searching.